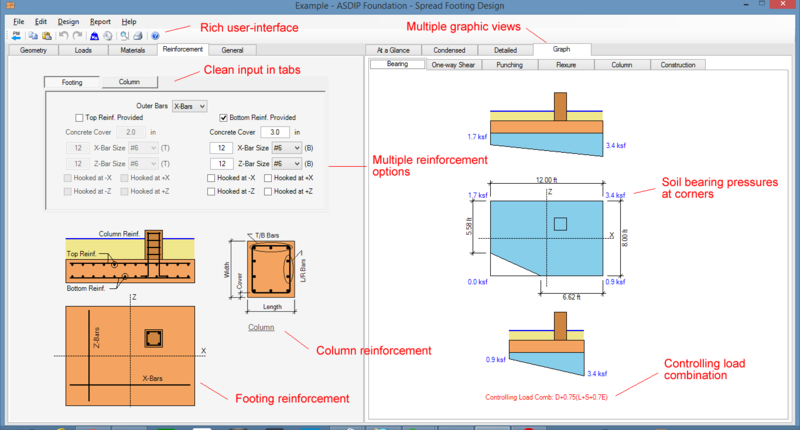 ASDIP Structural Software announces the release of ASDIP FOUNDATION (Version 3) structural engineering software. 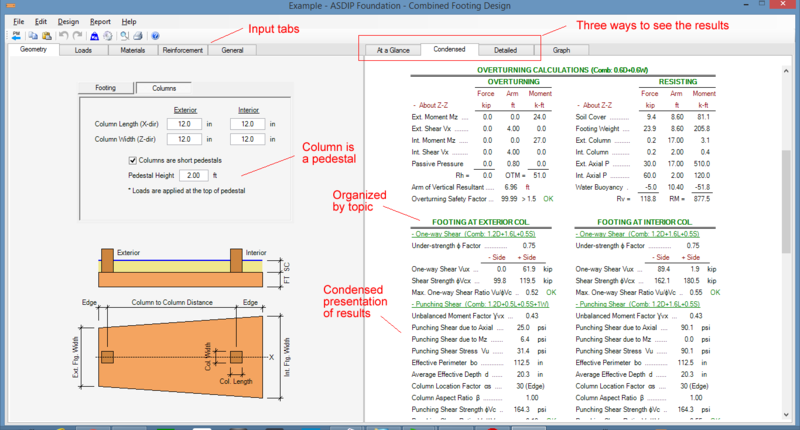 Utilize ASDIP FOUNDATION software for the design of spread footings, strap footings, and combined footings. Following are some features included in this version 3. ASDIP FOUNDATION 3 complies with the ACI 318-14 and ASCE 7-10 Code provisions. This structural engineering software accepts either pre-combined or nominal loads. It includes a new Detailed tab showing step-by-step calculations organized by topic, with exposed formulas and Code references. ASDIP FOUNDATION 3 has a new clean tabbed layout design. 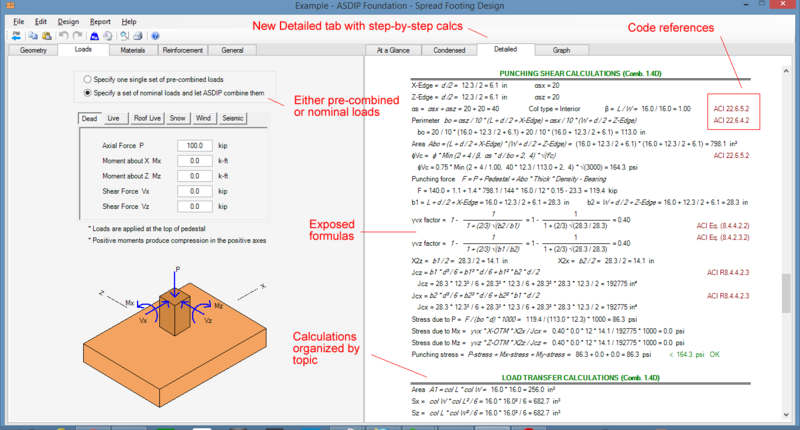 Controlling load combinations are identified and reported for each design step. ASDIP FOUNDATION 3 now includes the % of passive and friction acting together. This structural engineering software includes multiple options to model and customize the reinforcement. The soil bearing pressures are accurately calculated, even in partial bearing. 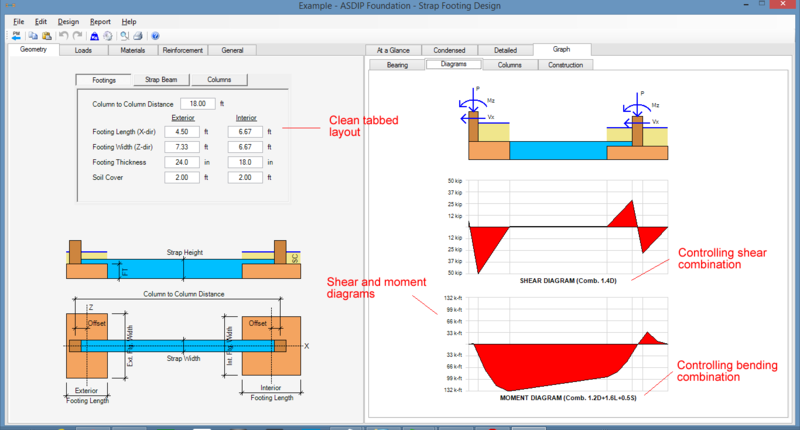 ASDIP FOUNDATION 3 now includes the buoyancy calculation due to high water table. 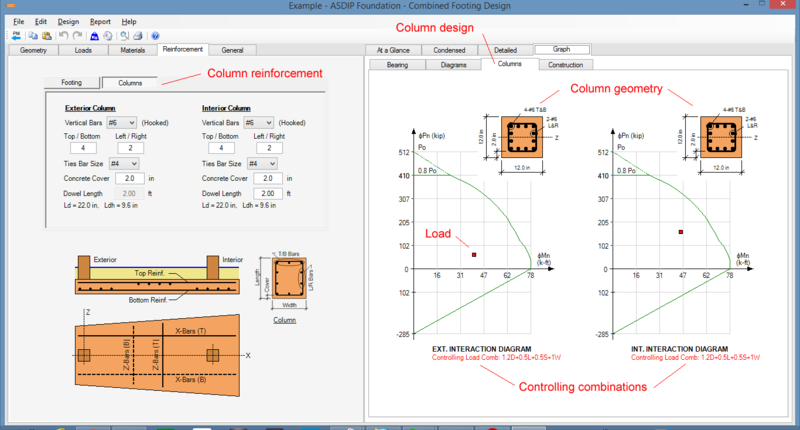 ASDIP FOUNDATION 3 now includes the column design. Columns may be treated as short pedestals. This structural software now includes / ignores passive in overturning calculations. Rich user-interface consisting of dialog boxes, pull-down menus, tool bars, fill-in-the-blanks format and in-field editing. Hola Javier, le quiero consultar si con ASDIP FOUNDATION es posible leer un archivo de excel con las cargas de cimentación generado por ETABS u otro software. Esto es con el fin de ahorrar tiempo ya que si un proyecto tiene muchas columnas es muy demorado el ingreso de cargas. En otras palabras seria ideal usar una interfase (API) que pudiera hacer esto. Actualmente no es posible hacerlo, pero es una buena sugerencia para las proximas versiones. Gracias. Estimado Javier, en el programa, dentro de la pestaña “Detailed” y en el apartado “Bottom bars” en las líneas correspondientes a X Ld provided y Z Ld provided las cuentas no parecen correctas. Please send me a screen shot to support@asdipsoft.com to understand better the issue. Thank you.